If someone asks me what my favorite drink is, I always answer: Tea! Tea is like a friend to me. When I get up in the morning, even if I am messy, I directly go to the kitchen and heat water for tea. I start the day and maintain it with tea. While I stay at home, I do not realize how much I drink. In the evening, my husband and I steep a new pot of tea, and drinking tea together in the evening is more delicious. As you can understand, the subject of this composition is Turkish tea. 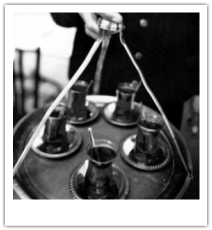 The history of tea in Turkey began in the early 19th century. Thanks to the favorable geographic conditions of the North-Eastern part of Turkey we can produce high quality tea plants. We do not have any special ceremony or specific time or place for drinking tea. Anytime and anywhere are acceptable for drinking tea. Although we call it ‘black tea’, Turkish tea is red, like our flag’s color. Turkish tea is always hot like our hearts. Turkish tea is served in a narrow-waist glass cup which has a shape like the famous Ottoman tulips. Turkish tea is steeped in special teapots. The preparation of Turkish tea starts with a big teapot. When water in this teapot boils, some of this hot water is put into another small teapot. (If the small pot is porcelain, tea will be more delicious. )Then tea leaves are put in the small pot and the small one is placed on top of the big pot. Steam from the boiling plain water in the big pot keeps the water in the small pot hot. After waiting for 15 minutes, Turkish tea will be ready for drinking. Steeping tea is like a master who teaches his apprentice to be patient. Loyal tea drinkers always prefer steeped tea and never consider a tea-bag as real tea. Turkish tea is the only thing we drink at breakfast. We call our family members to breakfast, saying “The tea has steeped!” This means that breakfast is ready. The tea, served in clear glass cups, heats our hearts like sunshine by its color and warmth. Turkish tea is the most frequently offered drink to guests in Turkey. Even if you go to a government office, a shop, a hardware store, a bank, etc., people serve you a cup of tea with two lumps of sugar. As you see, Turkish tea is peaceful and friendly. People need a friend to share tea, because while drinking tea we share our feelings and thoughts with our friends. Housewives invite each other to their homes for tea during the day. While friends are chatting, the bloom of tea warms the ambience. Workers have a tea-break in the middle of a busy day. Families visit each other in the evenings. In the past, when cities were smaller and families were closer, a child would be sent to knock on the neighbors’ door to ask them if the child’s family could come for tea. If the response was “OK sweetheart! We are waiting!”, the child would go back to his home, and the host would go to kitchen to boil tea-water. Even though, invitations for tea are now made by phone, the evening-tea ritual is similar to the past: The tea is served in a very attentive way as much as possible: Special narrow-waist tea-glasses on metal or porcelain saucers are offered to guests. The jingle of teaspoons, which mix sugar and tea, is like a short melody. We have a proverb: “Let’s eat sweet and let’s talk sweet.” In order for chatting to become sweeter, guests are served delicious sweets. A bite of sweet, a cup of tea and friendly chatting go on into the night. they aren’t welcome in coffeehouses. To sum up, tea is our friend during the day, a bridge which we build between us, a way that we send love to each other, and a companion with whom we share our feelings.